As a dietary supplement, take 1 scoop. Always consult your physician before taking supplements. Keep out of reach of children. Do not use this product if you are at risk or are being treated for high blood pressure, heart, kidney, thyroid, or psychiatric disease, difficulty in urinating, prostate enlargement, anxiety, depression, seizure disorder, or stroke. Consult your healthcare professional before use if you are taking anti-depressants, MAO inhibitors, or any other prescription drugs. Discontinue use and consult your healthcare professional if dizziness, sleeplessness, tremors, nervousness, headache or heart palpitations occur. Cissus from LiveLong Nutrition contains a highly potent extract of Cissus quadrangularis, clinically studied for its effects on joint health, anti-catabolic effects, mood, and appetite. Cissus quadrangularis is not a revolutionary discovery, but the clinical research done since its use in Ayurvedic medicine for centuries, sheds some very important light on the specific ways in which this unique herb may support everything from mood, to ligament health, to muscle preservation, and appetite control. 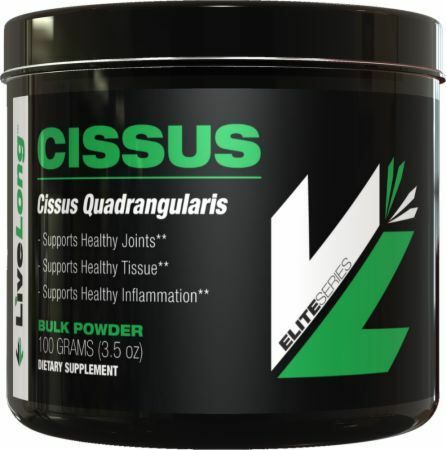 * Cissus took the market by storm a few years ago due to its suggested support for appetite control and soft tissue health. * Since then, thousands of satisfied customers have continued to order LiveLong Nutrition's highly purified extract of Cissus quadrangularis, and the list of benefits continue to grow. 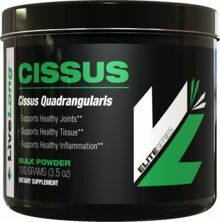 Cissus is one of the few herbal supplements on the market today that can boast such a wide array of positive benefits. It may be the many different antioxidants and polyphenols present in the powerful extract from LiveLong Nutrition, and it also contains a few powerful sterols that have been studied for their effects on several parameters of health. If you are looking for a high-quality, research grade preparation of Cissus quadrangularis, look no further than Cissus from LiveLong Nutrition!